The decision was made after Israeli Prime Minister, Benjamin Netanyahu, reportedly asked Defense Minister, Avigdor Lieberman, to clarify whether he has any intention to remove the settlers from Abu Rajab home. Israeli daily Haaretz said that, according to sources close to Netanyahu, the latter instructed Liberman not to remove the settlers from the building, on Tuesday night. The decision was then made to declare the home a close military zone, off-limits to Palestinians and Israelis, yet, the colonists remained in the property. 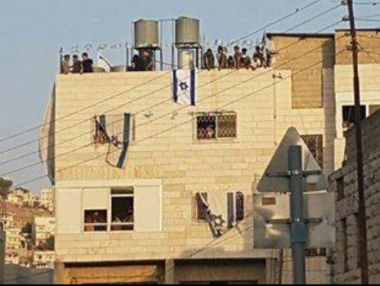 This is not the first attempt to occupy the Palestinian home in Hebron; in 2012, a group of Israeli colonists invaded it, under the same purchase allegation, but were later removed under direct orders from the then-Defense Minister, Ehud Barak. Haaretz stated that Israeli military directives in the West Bank require all purchases of real estate buildings to be authorized by the army. The office of the current Defense Minister, who himself is a colonist settler, has not, so far, decided to whether remove or keep the colonists in the Palestinian home.